ANONYMOUS -Harlekin en Bombario en den rouw. ANONYMOUS - Harlekin en Bombario en den rouw. Title : Harlekin en Bombario en den rouw.. Size : 11.4 x 9.8 inches. / 29.0 x 25.0 cm. Description :Harlequin and Bombario in mourning. 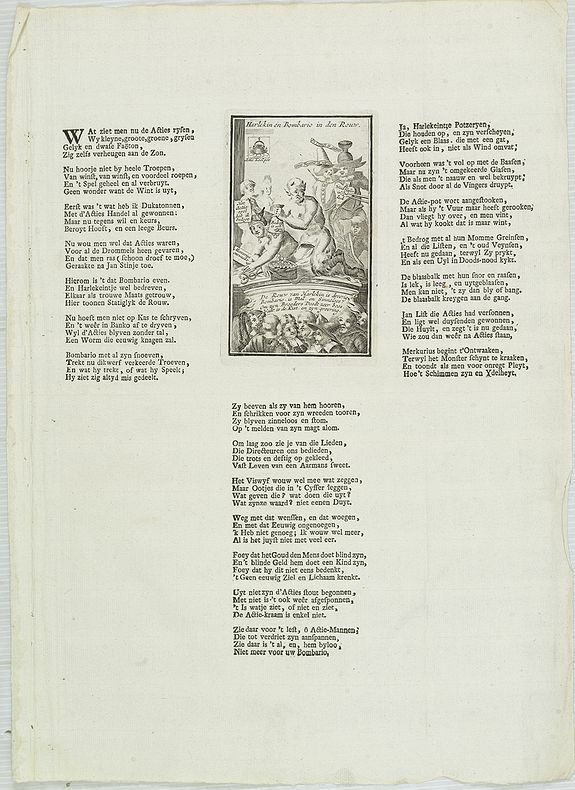 A caricature in prose and verse satirizing the first truly international speculative crisis in the history of financial capitalism, the "Mississippi scheme" (1718-1720) of the French Compagnie d'Occident and the speculations its stock that led to the complete ruin of many of its over-eager French, Dutch and English shareholders. John Law (1671-1729), the son of an Edinburgh banker and successful financier who established the "Banque Générale" in France in 1715, founded the Compagnie de l'Occident for the exploitation of the resources of French Louisiana after Antoine Crozat had surrendered his charter in 1717. Law's reputation caused the stock to sell readily, and the organization soon enlarged the scope of its activities by absorbing other commercial companies, its name than being changed to the 'Company of the Indies'. Enormous profits were anticipated...and the increasing demand for its stock led to wild speculation. The anticipated immense and immediate profits were not realized, and soon the scheme revealed itself as a purely speculative venture. In 1720 the company failed, the 'bubble' bust, and the stockholders lost their entire investment, many being completely ruined. Condition : In good condition. Copper engraving (130x77mm.) with letter press. Good margins.